The Dons return to action at Pittodrie for the first time in a month when they face St Johnstone on Saturday. It’s been a hectic schedule for the team with last Sunday’s narrow Betfred Cup Final defeat to Celtic being quickly forgotten about due to an excellent victory at Ibrox on Wednesday. December presented eight league games and the 1-0 win against Rangers was the perfect start following the disappointment of the Cup Final. On the eve of the game The Dons fans were boosted by the news that Connor McLennan had signed a new contract until the end of the 2020/2021 season. Tommy Wright’s men travel in good form and are unbeaten in seven following a 2-2 draw against Hearts in midweek. They sit a point above Aberdeen in fifth place, although The Dons have played a game less and a win would leapfrog the hosts into fifth and potentially fourth. Ahead of the game Derek McInnes and Scott McKenna spoke with the media on Friday morning. Joe Lewis also spoke with the Red matchday team ahead of the game. “We’re really pleased with the effort and performances the last couple of games and obviously we get the result on Wednesday. Going down to Glasgow and facing the Old Firm in two high profile games the performances have been more than decent. We’ve been well in the game in both and we’ve won one and lost one and the other night was a very important and satisfying response from the players. Delighted with what everybody gave on the night and we get our just rewards with a very important three points. “St Johnstone will be very high in confidence and winning five out of seven games and it’s a great run. I think they kept a new clean sheet record for their club and they’ll be full of confidence and it’ll be up to us to try and break them down and get the goals. “I am pleased with my own form. “I have always enjoyed playing in the big games and it is nice to be able to make some saves. Obviously the penalty save was a good one to make as at the time it kept us in the game, but unfortunately it did not have an effect on the end result. “At Ibrox it was nice to play your part in the clean sheet. I think it you go to Ibrox and go down to ten men, you are going to be called upon to make some saves. I was pleased to have played my part in a win that meant a lot to the players as well as the fans, even more so after what happened in the cup final. “As a goalkeeper there is no better feeling than playing your part and when you win 1-0 it feels that extra bit special. I felt all the players on Wednesday night deserved a clean sheet. I would include Sam in that as well. He is very unlucky and he was the one who got fouled. Unfortunately, he can’t appeal it which is disappointing for him. The Dons will be without Sam Cosgrove after the striker was sent off against Rangers in midweek following two bookings in the first half. 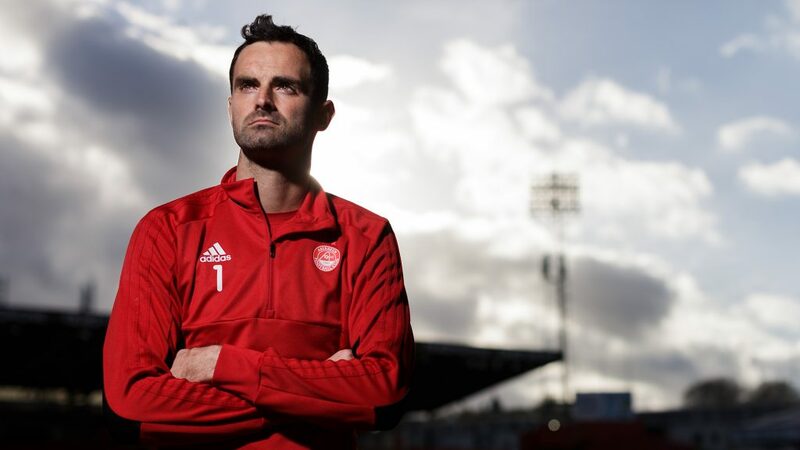 Derek McInnes confirmed today that both Michael Devlin and Gary Mackay-Steven will also miss the match, although it is hoped both will be available in the coming weeks. Mark Reynolds, Tommie Hoban and Frank Ross remain long term absentees. Saturday will be the second meeting between the sides this season after they couldn’t be separated in a 1-1 draw at McDiarmid Park in September. Aberdeen have the superior record when the sides have faced each other at Pittodrie boasting 33 wins compared to 14 Saints victories. The points have been shared 20 times with the last draw in Aberdeen coming in December 2016. Aberdeen’s biggest win at Pittodrie against St Johnstone came in September 1983 as The Dons ran out 5-0 winners. It’s no surprise that Saints’ biggest win at Pittodrie came in the 5-1 victory three years ago. The Dons had won eight of the first nine league games but were undone by an excellent performance from the visitors. Last season The Dons saved some of their best performances of the campaign for Saints as they inflicted heavy defeats on the men from Perth. An Adam Rooney hatrick in the first encounter produced a 3-0 win and Rooney was back amongst the goals in another 3-0 before Christmas. In the last meeting at Pittodrie Greg Stewart (twice) and Ryan Christie combined either side of former Saint Stevie May to send the supporters home with a 4-1 win. 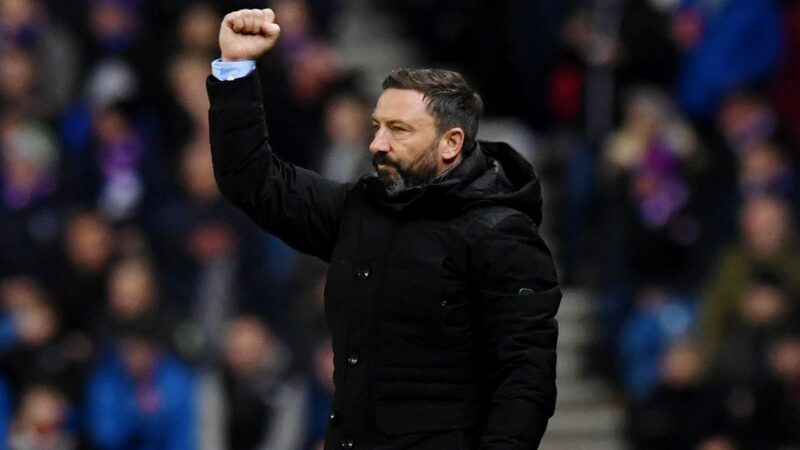 Under Derek McInnes The Dons have usually close contests with St Johnstone and the manager only holds a slightly better record of four wins at Pittodrie compared to three against and three draws. This will be the third of nine matches for The Dons in the month of December as the SPFL takes on it’s busiest period of the season. 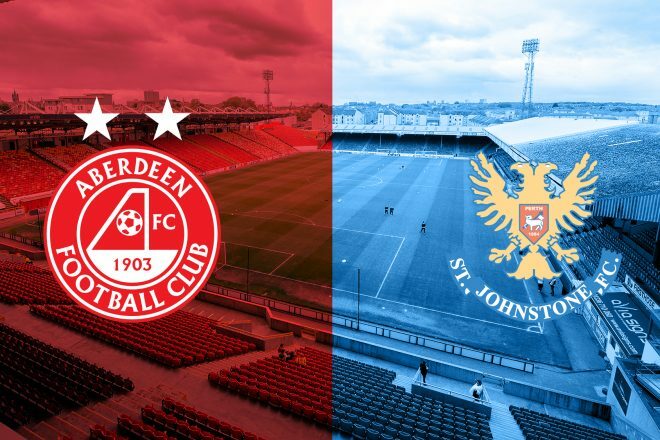 After Saints The Dons welcome newly-promoted Livingston to Pittodrie for the first time since 2006 and then travel back to the Glasgow area to face St Mirren in Paisley. If you can’t make the game on Saturday make sure to tune into RedTV from 2.45pm as former Don Derek Young joins the team. International subscribers can watch live at post-match we will have goal action, highlights, interviews and a full match replay. Enjoy the match and come on you reds! Two goals in three second half minutes gave St Johnstone victory at Pittodrie. 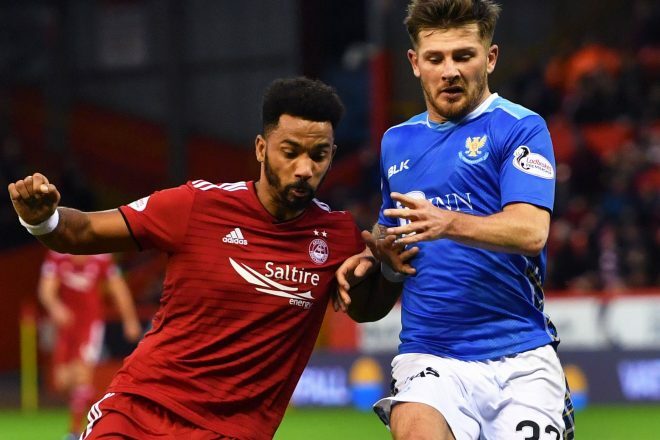 The Dons returned to Pittodrie for the first time in a month, for the first of five home matches in a hectic December schedule. McInnes made two changes to the side that triumphed over Rangers for the second time this season with Stevie May and Scott Wright entering the starting line up in place of Niall McGinn and the suspended Sam Cosgrove. The visitors, St Johnstone came into this fixture off the back of a terrific run of form – unbeaten in their last 7 games, winning five and keeping six clean sheets in thos ematches. The Dons started brightly, but it was the visitors who had the better opportunities in the opening stages. Ross Callachan should’ve done better when he found himself unmarked in the penalty area, but he couldn’t make a solid connection with his header and it sailed wide. Matthew Kennedy also had a shot from range which was tame and didn’t trouble Joe Lewis in goal. After weathering a solid start The Dons created their first opportunity of the game. Stevie May latched onto a through ball from Wright, although the angle was tight May did well to fire a shot across which crept just past the far post. Shinnie should’ve done better with an effort from range as the ball dropped to him 25 yards out. The captain had time to take it down and steady himself but the end product wasn’t there and he dragged his shot wide. Joe Lewis was called into action on 20 minutes, producing a smart save at his near post to deny Kennedy. The Saints striker latched onto a ball over the top and looked to catch Lewis off guard taking his shot early, but The Dons keeper was equal to it. Just before the half-hour mark Shinnie became the first player to enter referee Don Robertson’s book. After a poorly misplaced pass The Dons captain caught Tony Watt as the Saints looked to break and received a yellow card. Liam Craig, joined Shinnie in the book for a poor challenge. The free kick was in a good position for May to try his luck but his attempt was poor and went straight into the wall. The Dons continued to press for an opening goal which you felt was coming. Max Lowe looked dangerous down the left hand side and was causing problems with his deliveries into the box, unfortunately there were no takers in red shirts to capitalise. McKenna had a header scrambled away by Clark just before the break and the sides went in goalless at half-time. Both teams had early appeals for a penalty waved away by Don Robertson. Lewis Ferguson went down in the box before Logan slid in on Callachan. 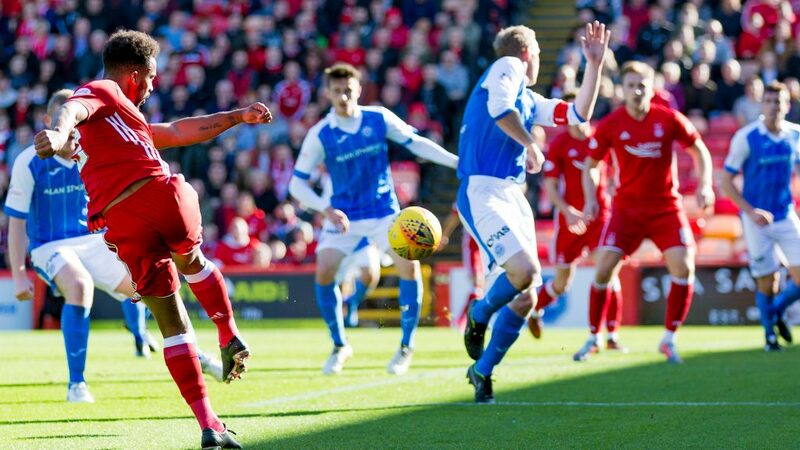 The Pittodrie faithful had their hearts in their mouths but Robertson adjudged that Logan got the ball much to the disapproval of the visitors. Scott Tanser was booked for persistent fouling after he took out Shinnie on the half way line. The home side had their first decent chance of the second half through Connor McLennan. After some good team pressing the ball squirted out to the Dons midfielder who shot was on target but lacked the power to beat Clark between the sticks. Minutes later, McLennan had another shot from distance which he fired over. Lewis Ferguson was next to chance his arm from range forcing a decent stop from Clark who parried out into the danger area, luckily for the Saints there were no red shirts following in the rebound to capitalise. On the hour mark, McInnes opted to change things up with a double substitution. McLennan and Wright made way for Niall McGinn and Bruce Anderson, switching to a 4-4-2 formation. Lewis was called into action once more, reacting well to close down Alston and block for a corner and from the resulting corner, Shaughnessy rose highest and nodded in from 8 yards out to give the visitors the lead. Things went from bad to worse for The Dons when Blair Alston doubled their lead just 3 minutes later. Alston found himself in plenty of space on the edge of the penalty area. The midfielder got his head up and made the finish look easy, curling it up and over Joe Lewis into the top corner. It was perhaps a bit harsh on Aberdeen who were not doing enough to be winning the game but did not deserve to be two goals behind. McInnes reacted immediately, bringing James Wilson on for Dom Ball. McGinn then went close from a free-kick forcing a decent stop from Clark who tipped it over the bar for a corner which eventually came to nothing. Frustratingly the final 10 minutes were incident free, The Dons huffed and puffed but couldn’t break down the rigid Saints defence who held on for a 2-0 victory.